ASP.NET 2.0 offers you several ways to set a dependency between a cached item and a file(s), another cached item(s) or SQL Server database table. No doubt they satisfy most of the real world needs. However, at times the features offered by these dependencies are not sufficient. In such cases you can create your own dependency and use it instead of inbuilt ones. In this article you learn how this can be accomplished. Imagine that you are developing an order processing application. The orders are received from various sources in the form of an XML file. Whenever an order is received the corresponding XML file is created on the web server. Whenever a new order is received you want some cached object to expire. 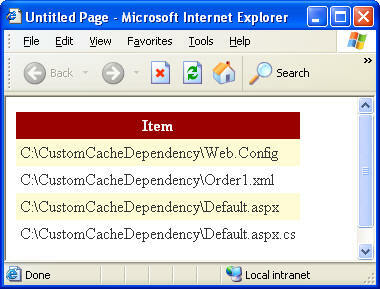 At first glance you may think of setting a file based cache dependency between the new XML file and the cached object. However, there is a catch. The same folder also accepts many other XML files and you do not want to expire your item when any such files are received. Also, the names of the order files are not fixed. The only way to isolate order files from the rest of the XML files is to check the root element of the XML file. If the root element name is "order" then it is an order file and you should consider it else you need to ignore it. As you might have guessed that such logic can not be applied with the inbuilt cache dependency techniques. In order to tackle the above problem you need to create your own dependency. ASP.NET provides a class called CacheDependency that resides in System.Web.Caching namespace and represents the base class for all custom dependency classes. For example, the SqlCacheDependency class that represents a dependency between a cached object and SQL Server table is derived from the CacheDependency base class. The CacheDependency base class is responsible for removing an object from cache when the expiration condition is met. The CacheDependency class provides a protected method called NotifyDependencyChanged() that must be called by the inherited classes so that the dependent item gets deleted from the cache. In our example we will create a class called MyCacheDependency that inherits from CacheDependency. Further, we will use a FileSystemWatcher to monitor the web site root folder. When any new file arrives the FileSystemWatcher will notify us by raising certain events. We will then check if the new file is an order file i.e. root element name is order. If the new file is an order file then we will call NotifyDependencyChanged() method to delete the dependent item. Here, we created a class called MyCacheDependency that inherits from CacheDependency class. Note that the CacheDependency class resides in the System.Web.Caching namespace which must be imported at the top of your class file. Then we declared a variable of type FileSystemWatcher. The FileSystemWatcher class residing in System.IO namespace allows you to monitor a folder for file system changes such as file creation, modification, renaming and deletion. In the constructor of the MyCacheDependency class we set the FileSystemWatcher to monitor the root folder of the web site. We obtain physical path of the web site using PhysicalApplicationPath property of the Request object. Then we set the EnableRaisingEvents property of the FileSystemWatcher instance to true. Setting this property to true will raise several events when the monitored folder changes. We are interested to handle event related to file creation and hence we attach an event handler to the Created event of FileSystemWatcher instance. When a new file is created on the monitored folder the FileSystemWatcher instance will raise the Created event. The event handler of Created event checks the extension of the new file. If it is an XML file (.xml) then it loads the file in an XmlDocument class. The XmlDocument class resides in the System.Xml namespace and represents the DOM parser of .NET framework. Then we check if the root element name (DocumentElement.Name) is "order" and if it is "order" then we call NotifyDependencyChanged() method of the base class CacheDependency. The NotifyDependencyChanged() method takes two parameters - sender and event argument. As the sender parameter we pass the reference of our class and as the event argument parameter we pass an empty instance of EventArgs class. Thus we send notification to CacheDependency class only if the new file is an order file. Here, we check if an item named myobject exist in the Cache. If it does not exist we call GetFiles() method of Directory class. The GetFiles() method returns an array of files in a specified folder. We will store this array in the cache. Then we create an instance of MyCacheDependency class and insert a new item named myobject in the cache along with the newly created dependency. The GridView control is then bound with the myobject array. The following figure shows how the GridView looks like at run time. Note that the root element of the XML file is <order>. Also, create a new text file with any arbitrary text. Save both the files. Now run the web form so that it displays a list of files as shown above. Now drag and drop the text file into the web site folder and refresh the browser window. Since we have dropped a text file the listing displayed in the grid should not change. This proves that the dependency has not yet deleted the cached object. Now drag and drop the XML file and refresh the browser window. Since we dropped an XML file and that too with <order> root element the grid will list the newly added file. This proves that the cached object was deleted and new one got created with the fresh request.